Whether you want to convert MOV to MP4, convert MP4 to MOV, or convert MOV to AVI, 4Video MOV Converter will always be your best choice. As the professional MOV video converting software, 4Video MOV Converter is specially designed to convert MOV to MP4, AVI, MKV, FLV, MP3, FLAC, and more. Surely, if you want to convert MP4 or other video formats to MOV, it also can do it for you. More than just a simple MOV converter, it highly supports 4K HEVC and 1080p HD video formats. So you can change regular SD video to 4K UHD file to get higher definition. Definitely, it will give you better visual experience on your 4K TV or 4K media player. What's more, it is equipped with many key editing features like crop/clip/rotate video, adjust output effects, enhance video quality, add watermark, and so on. You should give this all-featured MOV converter a try. •4Video MOV Converter can convert any popular SD video format (like AVI, WMV, FLV, MKV, M4V, Divx, Xvid, MPEG, 3GP, SWF, MPEG4, MOD) and HD video format (like HD MP4, HD WMV, HD MPG, HD MPEG) to MOV and HD MOV with exactly the original image/sound quality. •It can work as a powerful MOV to MP4/AVI/FLV/MKV converting tool to help you make the conversion from MOV to 4K HEVC, 1080p HD, and normal SD video format. Any frequently-used format is supported. With this MOV converter, you can easily get your preferred output format. •Convert MOV to any popular audio format like MP3, AAC, M4A, ALAC, MP2, AIFF, etc. •Convert audio to MP3, AAC, M4A, ALAC, FLAC, etc. 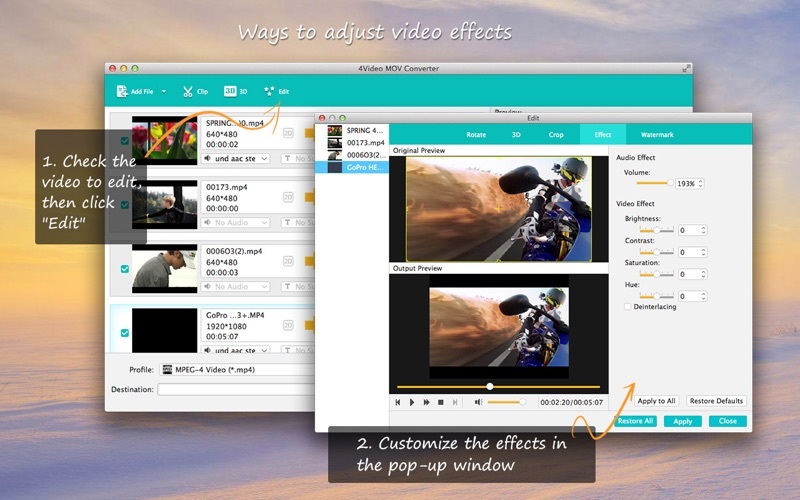 •Enhance video quality to get higher image and sound effects. •This powerful software can convert any frequently-used video format to MOV for playback on iPhone X/8/8 Plus/7 Plus/7/SE/6s Plus/6s/6 Plus/6/5s/5c/5/4S, iPad Pro/Air 2/mini 4, iPad 4, iPod touch 6/5/4 and more. 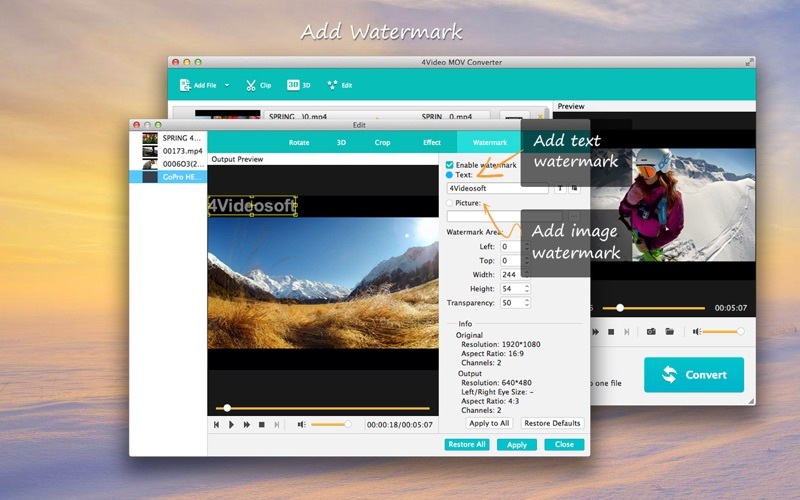 •The converted MOV file is compatible with any video-editing software like iMovie and Final Cut Pro. •Fully compatible with macOS High Sierra and other Mac OS. Need help? Please contact us via http://www.4videosoft.com/app-store/contact.html and you will receive a reply within 24 hours. Faster MOV to MP4 converting speed. Add more output 4K UHD formats.